Laura (Vanderhorst) Loeppky grew up in Charleswood and started officiating minor hockey in Assiniboine Park. She worked her way up through the AAA bantam and midget levels and became the first female to officiate men's junior hockey in Manitoba. 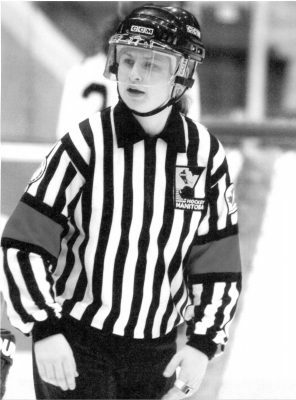 In 1996-97 Hockey Canada named her as Manitoba's most promising official. In 1998 she worked the first of five consecutive national women's championships. In 1998-99 and again in 2001-02, the national body honoured her as our province's most deserving official. She represented Canada in Finland in 1999, in Latvia in 2000 and in 2001 at the Women's Pool A World Championship in Minneapolis. The highlight of her career took place in 2002 when she was selected to referee at the Winter Olympics in Salt Lake City. Her ability there earned her the distinction of refereeing the bronze medal game. She also has conducted clinics for Hockey Manitoba and acted as a mentor to young female officials.